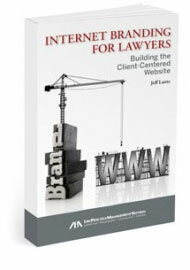 How can attorneys create an effective brand and website that will deliver new clients? What works well, and what aspects of the traditional website approach used by most firms should be avoided? An effective law firm brand and a compelling website are two of the most critical aspects of law firm marketing, as they can have a tremendous impact on new client development and revenue. Create powerful attorney profiles and practice area pages that convey the information that prospective clients are seeking. The Client-Centered Website approach is fundamentally different from the traditional law firm website approach, which focuses on the firm instead of on how clients are served. You’ll learn how to avoid the pitfalls of the traditional law firm website, as well as how to use successful branding and a Client-Centered Website as the cornerstone of your firm’s marketing program.